Don't Write Yourself Off (Yet):The Perks and Pitfalls of Personality Tests — Anna Akbari, Ph.D.
Buzzfeed and Zimbio are happy to tell you these days which celebrity boyfriend you should have, which European country you really belong in and which Harry Potter character you are. (I got Joseph Gordon-Levitt, Hungary, and Hermione Granger, by the way.) These personality quizzes, and other similar ones, have recently become a Facebook sensation, posted on everyone’s walls. We may think of them as just fun, but they do speak to something deeper. Humans love to categorize – inanimate objects, other people, but especially ourselves. Not only do we break the world down into races and genders, but we also divide people into “cat people” and “dog people,” or by astrological signs. We think that being associated with Hermione Granger, rather than an antagonist character, tells the world something about us. It might not matter in real life that Joseph Gordon-Levitt is supposed to be my boyfriend, yet some tests and forms of categorization can provide insight into yourself and others. However, proceed with caution. Complex personality methods can be fun to take and joke about with friends and family, but they also provide something important: self-awareness. Self-awareness is a key aspect to happiness, but also, to success. Daniel Goleman, psychologist and author, has written several books on emotional intelligence. In an interview with Forbes, he says, “Science has learned that if you are tuned out of your own emotions, you will be poor at reading them in other people. And if you can’t fine-tune your own actions – keeping yourself from blowing up or falling to pieces, marshaling positive drives – you’ll be poor at handling the people you deal with. Star leaders are stars at leading themselves first.” Goleman lists self-awareness as a central part of emotional intelligence. It is the part that allows you to understand your own needs and choices and plays a key role in workplace success. In his book Focus: The Hidden Driver of Excellence, he discusses the three kinds of focus for success, one of which is self-awareness. He says that self awareness “lets them manage their inner world well.” Yet, self-awareness and categorization have their limits. While it can provide helpful information, no test is the answer to all of your problems. Why do you behave or think the way that you do? What do you need to be your best self? You might find that you struggle with your job because you are a big picture thinker working in a detail-oriented position. Different methods can help you understand different aspects of yourself. For example, the Five Love Languages method identifies the kind of attention you need to feel loved. It can shed light on your relationships, and why you’re not emotionally satisfied by certain friends and family members. While the Five Love Languages method is narrow, focusing on one specific trait, it can be helpful in identifying a part of yourself that you didn’t previously understand or know how to put in words. The Goddess archetype method, from the book Goddesses in Everywoman, helps you to identify yourself based on priorities and focus. Your Goddess type can change throughout your life, according to psychologist and author of the method, Dr. Jean Bolen. If your priorities shift, for example, from career to marriage, or from children to freedom, your primary goddess might switch. Quite popular in the 1980s, this particular method was parodied on Friends. There are two wider tests that have become particularly popular in the last 20 years, although both have existed for well over 50. The Myers-Briggs Type Indicator (MBTI) is focused on how you receive and process information: how do you see the world around you? The Enneagram is focused on motivation: what drives you in life? Many workplaces have personality testing days, where employees participate in a personality method. This is often Myers-Briggs, but can be one of many other tests that are specifically designed for workplace success. Sometimes this is used to determine skill-sets or future work groups, but often this is simply to promote self-awareness. Alternatively, the 12 Career Archetypes test is focused on what career you should have, rather than testing you once you are already there. This test was formulated by the authors of The Hero and The Outlaw to explain corporate strategy and marketing. However, it has expanded into a widely used test for career choices. For careers in the Police Department, and other high risk positions, the MMPI (Minnesota Multiphasic Personality Inventory) is administered to test for mental illness. This test has had significant revisions over the years, due to complaints of ethnic bias. Many consider it to be inaccurate for this reason, nonetheless, it is still often used as a part of a larger psychological analysis. Personality tests can teach us a lot about ourselves and others. However, there are a few points of caution. First, avoid typing others. As Baron and Wagele say in their book, The Enneagram Made Easy, “You will readily begin to ‘type’ people you know. We urge you to keep your guesses to yourself and keep an open mind. Deciding one’s type accurately is important and must be done by each person according to his or her own internal perception.” It is important to remember that you can reach the same conclusion through many different strains of thought, and we are not in anyone else’s head to see how they think. It is a lot harder to type people than you might think. 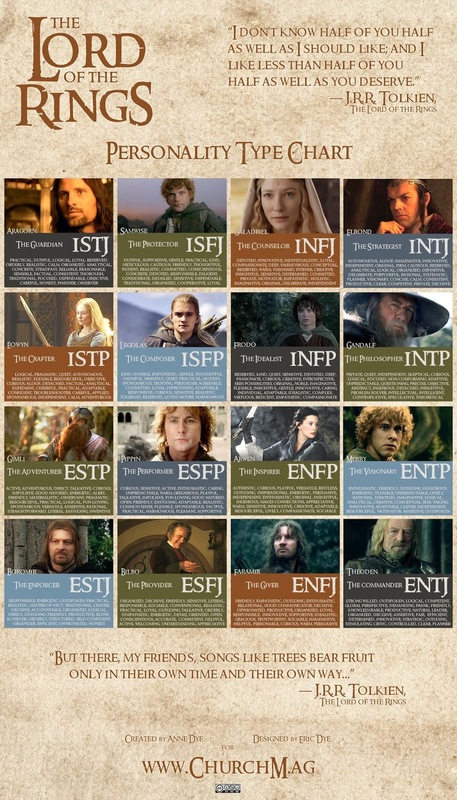 For example, recently Facebook has been littered with Myers-Briggs breakdowns of popular book , film and television characters. Many of these charts have different versions made by different fans, each suggesting that the same characters are very different types. People’s types may surprise you, no matter how well you think you know them. I know several people who are Type 4 on the Enneagram: “The Tragic Romantic.” On the surface, these people seem as different as two people can be: one extroverted, theatrical male who loves parties and being the center of attention, and one quiet, intellectual female who prefers intimate conversation to a crowd. Just like you can take different paths to reach the same conclusion, you can take the same path to different ends. What these individuals do share is a deep sensitivity to the world around them and a whole-hearted search for the meaning of life. Their motivation is the same, and therefore, they are the same Enneagram type. Other methods are easier to see in others, such as the Goddess Archetypes, because it looks at priorities. Does her world center around her husband, her job, et cetera? However, I still discourage too much vocalization of typing others. Boxing anyone into a type they haven’t chosen is poor personality testing etiquette. So you might ask, if I can’t type people, why will personality tests help me understand others? Personality test taking is infectious. If you take it and enjoy it, others around you will become interested as well. Also, once you’re more aware of why you behave and react to things the way you do, it is often easier to forgive others for behavior that might not initially make sense to you. I had a friend who I liked a lot, yet she would occasionally get on my nerves and I couldn’t figure out why. Soon, our group of mutual friends became deeply immersed in the Enneagram method. Only when I saw that we were the same personality type did I realize that what had annoyed me was that she usually said exactly what I was about to say! While complex personality methods all focus on telling you something about yourself or others, no test will tell you everything about someone. Each test is designed to tell you certain characteristics of a person. There are more than 9 (Enneagram) or 16 (MBTI) identical people walking around. You cannot know everything about a person simply by their type. So don’t judge people completely based around personality types or obsess over figuring out their types. And lastly, your personality type is not an excuse for bad behavior. Every personality type in every complex personality method has certain negative traits. Identifying yourself proudly as a type isn’t an excuse to descend into your own worst features. The Enneagram: You can take the test for the Enneagram here. The full test costs money, but there are good free versions online. However, you can type yourself without taking the test, by thoroughly reading about the types and categorizing yourself. Even if you do take the Enneagram test, they recommend that you study the three types in which you scored highest, and proceed to make the decision for yourself. I recommend Baron and Wagele’s comprehensive book The Enneagram Made Easy. The MBTI: The MBTI can be done for personal use or as part of a workplace testing program. Personally, I think it is most effective when applied to your life as a whole, analyzing your personal lifestyle and work choices. You can take the test for MBTI here. It does cost money, but there is a free version. I recommend Briggs-Myers and Myer’s book Gifts Differing. As you may have guessed, it is written by the creators of the MBTI test. The Love Languages: If you’re interested in learning more about your love languages and how they affect your relationships, read one of Gary Chapman’s books on love languages. The Five Love Languages is the original one. It talks about how you give and receive love most effectively. The love languages are quality time, gifts, acts of service, words of affirmation, and physical touch. The Twelve Career Archetypes: Margaret Mark and Carol S. Pearson wrote The Hero and the Outlaw to explain marketing and brand strategy using twelve archetypes. These types have become widely circulated to determine potential career paths. An easy online test can be taken through salary.com. The Kiersey Temperament Sorter: The MBTI has been a prevalent test for so long that many people have expanded on it. One popular expansion is the Kiersey Temperament Sorter, often used in workplace tests. It sorts you, using Myers-Briggs type, into four temperament categories: Idealist, Rational, Guardian and Artisan. The Kiersey Temperament Sorter is largely for conflict resolution and team building in the workplace, but can be expanded to other office-centered tasks, such as customer strategy and sales tactics. The MMPI: The Minnesota Multiphasic Personality Inventory is a test often used to screen for mental illness in high risk careers. It can also be used to test success in substance abuse treatment programs. Very hard to find online, the test should be performed by trained psychologists to be the most successful. It is a lengthy test with results that should be carefully analyzed before making any certain conclusions. You can read about the result options here. So do your research, have fun, learn something about yourself, but remember, these tests are still not the answer to everything!